"I am very, very sorry for the terrible distress that I have caused you. I am very, very sorry..."
Adapting a popular novel for the big screen is tricky business and can lead even the most talented filmmaker into creative traps. Some ambitious screenwriters and directors might try to deliver grand, sweeping marathons that look gorgeous, but they rarely match the books' achievements. Others will cut huge portions from the story, leaving fans enraged and other viewers confused. Resting somewhere in the middle is Joe Wright's (Pride & Prejudice) take on Atonement, the popular 2001 romantic epic from British author Ian McEwan. The film version provides several wondrous set pieces that helped to earn seven Oscar nominations, including Best Picture. However, it ends up an uneven tale that loses steam during a bloated middle act. The overall result is engaging but falls short of providing a consistently brilliant picture. Keira Knightley and James McAvoy star as Cecillia and Robbie�young lovers stripped apart almost immediately after discovering their strong attraction. An unjust charge sends him off to war and shatters a possible romance. It's difficult to discuss the opening act without giving away too much of the plot, but it's safe to reveal that Cecillia's young sister Briony (Saoirse Ronan) generates the separation. An aspiring author, the bright 13-year-old has a wide-ranging imagination that might play tricks on her. Wright presents several early scenes from multiple points of view to reveal both the perception and the reality. The first act moves swiftly and maintains an excitement that's lacking in much of the later action. As Cecillia, Robbie, and the mansion's other inhabitants glide quickly through the house, the upbeat score keeps us moving right with them. The sense of impending dread grows, and it�s not a surprise when the evening concludes terribly. Wright's confident work shines during this portion, which shows the visual possibilities of the effective source material. Instead of feeling like a literary romance, the pace seems modern and energetic, which drives the narrative successfully. This might be a good time to discuss the performances of McAvoy and Knightley, but they barely leave an impression. Both actors look stunning, especially in the early stages, but I felt little connection with their characters. We hardly know them and see only a few quick scenes, so it's difficult to connect with their situation. The fault can't rest entirely on the rising young actors and must also go to Wright and writer Christopher Hampton. The film's success hinges largely on our ability to care for Cecillia and Robbie, and they generate only a passing interest. A meet-up in Paris does generate some romantic sparks, but not enough to carry us to the picture�s end. I haven't read the novel, but I can guess that it provides more background on their relationship. The story's most intriguing character is Briony, played as an 18-year-old by Romola Garai. Working as a nurse during the war, she longs to atone for her acts and connect with Cecilia and Robbie once again. The deserving Oscar nomination went to young Saoirse Ronan, but Garai also deserves recognition for performing well in a difficult role. 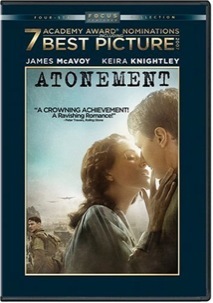 Atonement's does succeed greatly when you consider Seamus McGarvey's lush cinematography and the gorgeous art direction. Another highlight is Dario Marianelli's impressive score, which took home a well-deserved Oscar (the film's only win). Much of the critical acclaim after the initial release focused on the five-minute Dunkirk sequence, presented in one complex take. The ambitious scope of that scene is highly memorable and offers a far-reaching look at the war experience. However, one excellent scene doesn't entirely compensate for the less-inspiring war scenes, which add little to the personal story. Thankfully, Vanessa Redgrave�s compassionate performance during the final scene makes the journey worthwhile. When the rug disappears from beneath our feet, it is exciting to see how Wright and Hampton still create a surprise. The epilogue largely works thanks to Redgrave, who reveals a depth that's missing in the younger stars' performances. Her sad visage remains with you and makes the haunting picture a more notable experience. Image Transfer Review: Atonement uses a 1.85:1 anamorphic widescreen transfer that offers a top-notch presentation. The lighter early scenes shine brightly, and the sweeping shots at Dunkirk remain effective on the small screen. From a technical standpoint, this DVD performs very well and deserves high marks. Audio Transfer Review: This release's audio offering is even stronger than the images, which is saying a lot. The 5.1-channel Dolby Digital transfer does serve Marianelli's score well and increases the film's success considerably. Its use is especially strong in the opening sequence and helps to enhance the tension. Extras Review: Atonement doesn't offer a packed special edition, but there are some notable extras. Joe Wright offers a dry, scene-specific commentary that covers the plot far too closely. It might have helped to have another speaker�possibly a producer or the editor�to create a more engaging atmosphere. Wright spends a little bit of time discussing his disappointments and the book-to-film adaptation, but his statements generally are dull and obvious. The director also gives comments on seven deleted scenes lasting about one minute per entry. There are few exciting moments here and the cut footage is generally just unnecessary filler. This release also includes a 26-minute documentary and a five-minute featurette that offer some worthy background. Bringing the Past to Life: The Making of Atonement describes all the movie's key topics. The areas discussed by the cast and crew include the makeup, costumes, visual style, and the final revelation. We also hear about the lengthy Dunkirk shot and the difficulties involved with shooting it. From Novel to Screen: Adapting a Classic is the shorter piece and contains an interesting response from Ian McEwan on the adaptation. We also learn about the screenplay, which required a major rewrite to grow closer to the book's structure. Atonement suffers from the weight of expectations generated by its Oscar nominations and critical acclaim. Removed from the high praise, the picture offers an interesting story and several compelling sequences. It would benefit from more character development and a tighter second half, but I'd still recommend a rental if you're in the right mood.